Our process is comprehensive but simple. We use clear writing, expert design and usability testing to deliver better information. Our approach is evidence-based. Our work combines our long experience, our knowledge of the existing research literature, and testing with users. For you we deliver highly usable patient information. For consumers, information is the one medicine “ingredient” they judge you on. Make it the best it can be! usability testing to deliver better information. Click an icon for more. Everyone writes clearly – in their own opinion! After all style is a personal thing … In fact, it isn’t. To get information across efficiently, there are hard and fast rules about what to say and how to say it. An instruction will work better with an explanation behind it. Active works better then passive, positive better than negative. Expert review: Of course the words that can be used in product leaflets are also affected by regulations. An expert text review is part of every Consumation project – helping you to do the best by medicine users as well as meeting your legal obligations. We are information designers. Our approach to designing documents goes beyond pretty colours and fancy fonts. 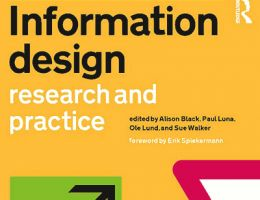 Every choice we make is based on a body of research: typeface, spacing, colour contrast, heading styles – each of them has its own small role in how people search for and acquire information. Together, those small details can make a big difference. European law requires that medicine package leaflets are "written and designed to be clear and understandable" to general users. Most regulatory activity concentrates on text review. So is design important? The short answer is yes. A longer answer would tell you more about how it works. If you’re interested, there’s more on our published research under How we work. Usability testing shows up problems. Researchers and designers use this type of testing in many fields: software, websites and document design. We are research-led designers, not just testers. The testing we do is radical and often humbling. It may show you that your best work is full of holes. However, if you know how to interpret it, it will also point you to a way to fix the faults. Consultations with users of medicines leaflets has been recommended in the EU since 1998, and legally required since EU Directive 2004/27. We’ve been doing it for longer – taking inspiration and instruction from the Australians, whose programme began in the early 1990s. “User consultation” on package leaflets has been legally required for all package leaflets in the UK since 2008. First, because we test leaflets, not users. We don't want participants to feel that they are taking an exam! 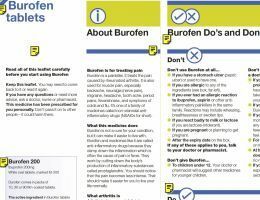 Our unbranded leaflet format – codenamed Burofen – is one of our most widely copied designs, and it’s easy to see why. Innovative but clear and simple in design, it has a number of our trademark innovations built into it: from the careful use of bolding, word order and icons, to the ultra-clear sectioning and transparent structure. You can download an annotated version of the original Burofen design by clicking here. To get the up-to-date version, just Contact us. How much does good design matter? European law requires that medicine package leaflets are "written and designed to be clear and understandable" to general users. However, most regulatory activity concentrates on text review. How much does good design matter? As information designers, we at Consumation set out to demonstrate the benefit of good design, and to see whether we could prove that it made any difference to the performance of package leaflets. We took two different presentations of an identical text, with and without features of best design practice; and we subjected them both to user testing, using the European Commission's regulatory guidelines. Results: The "under-designed" leaflet failed the benchmark; the "best practice" leaflet passed. When we further investigated search times, we found marked differences that convinced us of the effect of design. So we now have evidence that expert design of a package leaflet can transform people's understanding of the information it contains. We plan further research. In the meantime, we can start defining what gives leaflets a friendly and accessible feel. Our findings were published in an article for the Information Design Journal, (IDJ 18(3), 225-240 (Amsterdam, 2010) as part of a special issue on healthcare. Visit them, or contact us for further information. 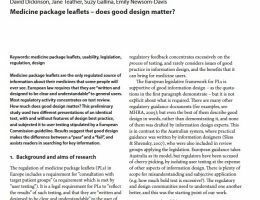 What does good design look like in a medicines package leaflet? What are the best ways to use bold and bullet points? How much bold is too much? How can we write and design leaflets to help the least able readers? The book is available as a paperback and as an e-book. Full details here. Product information is tightly regulated. We'll help you produce highly usable documents, compliant and on time. Information is also a window onto your product for consumers. It’s the only “ingredient” they can pass judgment on. Make it the best it can be! When the UK medicines regulator, the MHRA, wanted a new version of their report forms, they asked us to help. Our prescription cards, posters and redesigned forms were all designed to help patients report simply and without fuss. 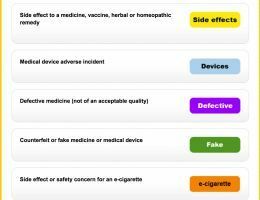 Our redesign of the Yellow Card forms for reporting side effects was part of the UK regulator’s drive to encourage patients to get involved in reporting the side effects of medicines. The MHRA had previously only accepted reports from health professionals. Building on a completed pilot scheme, and in parallel with a new computer system, we produced not only more user-friendly forms but a whole suite of materials to be used in pharmacies to explain the scheme and encourage people to take part. More details here. When your child is in pain, you want information quickly and you want to understand it correctly. 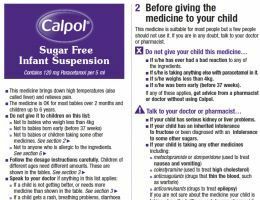 The design of a leaflet for Calpol, a children’s version of paracetamol, was chosen as the UK regulator’s PIL of the month. The company chose to roll out the simple but distinctive style across their whole range. Simple, eye-catching icons help users to find the most important points.